Out of all the attractions at Disneyland, there’s always one that I simply have to hit before I leave the park...every day that I’m there. This attraction opened in 1969 and has been a huge hit ever since. The Haunted Mansion is a fantastic ride with tons of eye candy to look at. I challenge everyone reading this to try and find something new each time you ride it, because you undoubtedly will. This ride has a lot going for it but one thing in particular has piqued my interest. The first time I heard of this character, I thought people were joking. You know, like "Walt Disney was cryogenically frozen" joking. But nay! This is no joke, folks! This elusive character did in fact thrive in the Haunted Mansion when it first opened! I’m talking about none other than the Hatbox Ghost! The hatbox what now? I know, right? That's exactly what I thought when someone with unemotional useless knowledge told me about it. (Thanks Jake!) (Editor's note: No problem!) 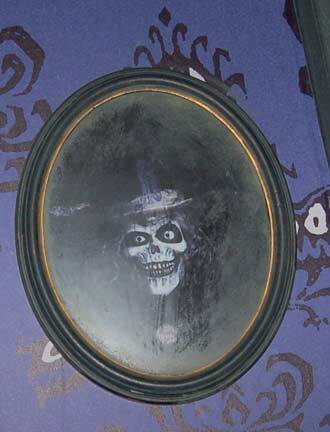 Apparently this ghost guy, this specter in the night, with a lovely hatbox, was actually in the ride when it opened. According to Tony Baxter, he was located where the bride ghost is in the attic. 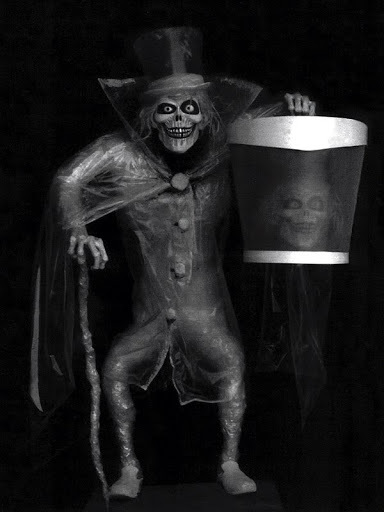 The Hatbox Ghost can be found on all sorts of old Disney memorabilia! He was on records, lunch boxes, hat boxes, blue police call boxes...you get the picture. Disney sold this guy to the public and then in excellent Disney fashion, they ripped him out of the ride quicker than the heavy petting couple that was in the buggy behind you! "I have Hatbox in the attic!" Why did they do that? From all of the pictures I've seen, it looked awesome! He didn't do much. His hand with the cane in it apparently shook as if he was an Epileptic staring into Pikachu's eyes, and his head would disappear, but then reappear inside of the hat box! Awesome! That’s classic Disney trickery! So why then did he leave so quickly? How quickly, you ask? I’m glad you did! (Editor's note: I didn't.) Approximately three months out of the gate! There was a rumor that it was too scary for children to look at, but that’s not true at all! Snow Whites Scary Adventures is scarier than Mr. Hatbox! Not to mention the Haunted Mansion itself starts off with a man hanging himself. Truth be known, the effect of his head disappearing, then reappearing inside the box, just didn't work right. It worked great before Yale Gracey put him in the attraction, but they couldn't fine tune it once it was there, and following Disneyland’s standards, if it doesn't work properly, and they can’t fix it, get it out of the attraction! His portrait still hangs in the hall to this day! So that's the fate of ole Hatbox! His legend seemed to be short lived, but lately, fans from all over the world have been begging Disneyland to put him back inside of his rightful home. Will they do it? I have no idea. Do I want them to do it? Do I love donuts more than life itself? It would be incredible to see him in the attraction again! I personally would love it, and I’m not the only one. The way ole Hatty’s legend has grown over the past few years has been amazing! Disney has even started toying with the notion by making Hatbox Ghost souvenirs available in the shops! 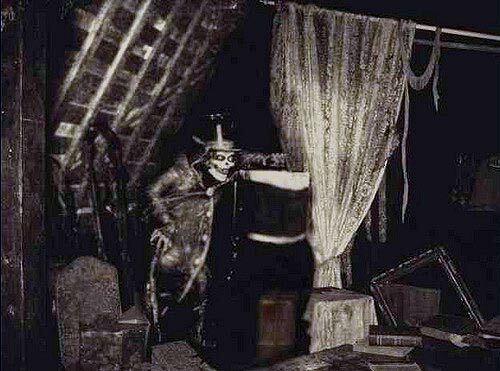 Director Guillermo del Toro even has a rebooted Haunted Mansion film in the works featuring the Hat Box Ghost. In conclusion and in my professional opinion, I feel that they should bring him back home, but don’t tell anyone! Make his appearance just as mysterious as his disappearance. I think if Disney played on that, and fueled that fire, the Haunted Mansion would hands down become the most popular ride at the park! After Hatbox had been in the ride for about a month, start advertising then that he’s back, but very mildly. Posters with only a ghostly hatbox on it that simply states, Disneyland! I would love to see him back! Make it happen, Disney! Stupid browser ate my comment when I tried to post it. Grr. Let's try again.